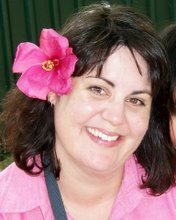 Leanne's Little Place: Celina Visits - always entertaining!!!!!! With Phillip's Birthday yesterday and the Royal Show being on for the last week or so. 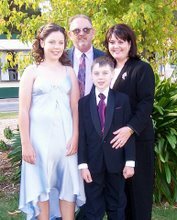 Celina and family made the trip down to Adelaide and off to the show they went. They got back to our place last night at about 9pm. God love Celina, she didn't come home empty handed for our kids, she spoils them! 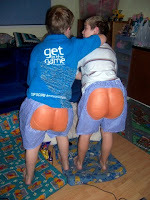 Aaron got a Gag Magic show bag, which had these ever so gorgeous "bum pants" in them, the boys loved them LOL!!!!! Aren't they just totally gross. Aaron even slept in his last night - boys!!! Celina was meant to go home last night, as she has Phillip's Party today, but Celina being her, always the spontaneous one, never quite got there....they had come down in two cars yesterday (the reason for that is another story LOL) so John left with Phillip and her and I got talking and next thing we know we are making up beds and getting out spare PJ's. I so love that she does that. Aaron and Jarrod just love one another's company, they are such close cousin's. 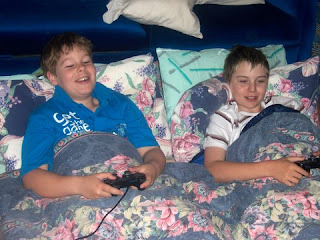 Here they are all set up in bed, playing playstation, this was about 11.00pm last night. Celina left this morning about 8.30 but not before she entertained us again with this classic. 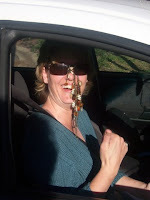 Her with her sunglasses tangled with bling.....she so loves her bling. She is such a breath of fresh air and I love her to bits. love love love them bum pants!!!! !